I just came across a blog that has instantly been added to my favorite blogs list! 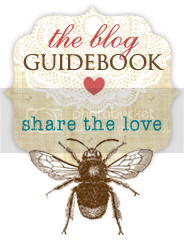 The Blog Guidebook! Why is it so amazing? Well, because it is a great resource for all things blogs! You can get your own blog listed for FREE and find hundreds of blogs in so many categories! Like DIY, Adoption, Design, Teens, Health, and sooooo many more!! They also offer tips and news and so much more! So excuse me while I go do some blog exploring! Make sure to give them a visit and join the Guidebook! !